Located in the posh center of Sanlitun, the new space is airy and open. No really – there are no doors or walls here, capturing the best of the casual food hall vibe. Kup Kup Kup’s menu goes beyond Thailand, offering authentic eats found on the streets of Malaysia, Vietnam and Singapore. Our bowl of bun cha (RMB58), an iconic Vietnamese staple, transports us to the crowded food stalls of Hanoi – the delightful dish of pork meatballs and broth served with a basket of rice noodles and fresh herbs is a standout. With a few exceptions, the majority of the menu is meant to be shared, so bring your party crew. 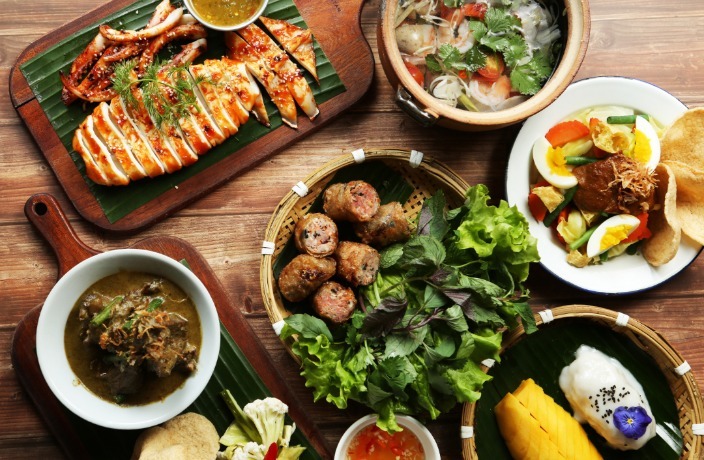 Don’t miss the 12-piece satay platter (RMB78), featuring tender skewers of grilled chicken, lamb and beef, marinated and served with house-made satay sauce. But Kup Kup Kup doesn’t just stick to tradition. The sriracha hot wings (RMB48) are an unconventional offering – deep fried and marinated in a secret sriracha sauce, these wings come in different spice levels ranging from one to five. Our advice? Work your way up. Despite our high spice tolerance (or so we thought), we were feeling considerable regret by level two. Pair your meal with cutesy cocktails served in gimmicky flamingo floats or glammed-up milk teas that are begging to be posted on Instagram. Essentially, it doesn’t matter what the Beijing weather brings – the Kup Kup Kup guys are forever on island time. The trendy eatery is open all day but we recommend going at night. The laidback vibe makes us feel like we can truly let go and unwind after a long day. Thanks to the help of a couple of Saigon beers (RMB34), we’re completely tuned out of the hustle and bustle of the city outside by the end of our stay. With a mellow atmosphere and impressive street-style grub, Kup Kup Kup is sure to become a frequented hangout spot where you don’t need to cough up too much dough to enjoy a fun night out in Sanlitun.